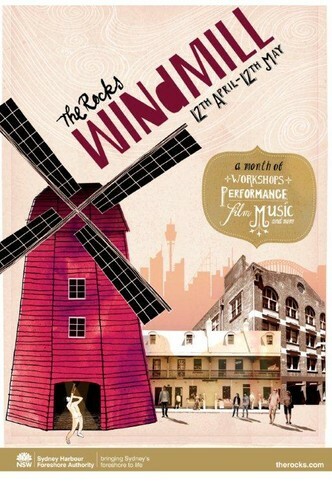 A four-storey windmill will stage a series of fascinating events exploring the history and culture of The Rocks through art, science and the imagination. From Friday 12 April to Sunday 12 May 2013, the rich history and cultural heritage of The Rocks will come to life as Sydney Harbour Foreshore Authority launches a thought-provoking and visually stunning interpretive icon in the heart of one of Sydney’s foremost arts hubs. Known as ‘The Rocks Windmill’, the striking large-scale temporary installation will act as a functioning wheat-grind as well as a vibrant and intimate 40-seated venue. A month-long cultural event program will give voice to the centuries-old design of Sydney’s fascinating heritage precinct, while also delving into contemporary subjects around urban sustainability. Inspired by The Rocks’ colonial windmill era, Sydney Harbour Foreshore Authority’s innovative project features theatre and screenings, visual arts and interactive installations, workshops and historical tours, all designed to entertain and educate visitors on The Rocks’ heritage and natural environment. Please note that 90% of the event program is free however spaces are limited and bookings are required.